Back cover blurb: Audra has finally left her abusive husband. She’s taken the family car and her young children, Sean and Louise, are buckled up in the back. This is their chance for a fresh start. Audra keeps to the country roads to avoid attention and finds herself on an empty road in Arizona, far from home. She's looking for a safe place to stay for the night when she spots something in her rear-view mirror. A police car is following her and the lights are flickering. Blue and red. As Audra pulls over she is intensely aware of how isolated they are. Her perfect escape is about to turn into a nightmare beyond her imagining… Dark secrets and a heart-pounding race to reveal the truth lie at the heart of this page-turning thriller. Here and Gone is a very different novel to any I've read recently. It is largely about one woman's fight for survival and her determination to never give up. I loved it's authenticity. Although initially some of its happenings may seem a little hard to believe, that's kind of the whole point and part of Audra's battle is to make someone believe her story. Audra has finally left her abusive husband, her children, Sean and Louise are safe with her on the road. Audra doesn't know exactly where she's going but she does know that it needs to be as far away from her old life as possible. When she is pulled over at the side of the road by the Cops, she thinks nothing of it. Of course she is going to lie about her reason for travelling in case her husband is searching for the kids, but she doesn't believe she is in any danger. Sadly for Audra, this is only the beginning of her nightmare, and her life is about to get a whole lot worse than she ever could have imagined. Without saying too much more, Here and Gone is a terrifying tale of domestic and emotional abuse, the secrets hidden by the dark web and our willingness to accept the word of those in authority, even when something doesn't seem right. 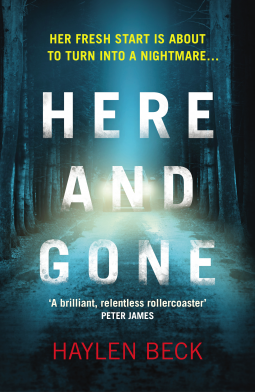 Here and Gone is available now via Amazon online and all good book shops.